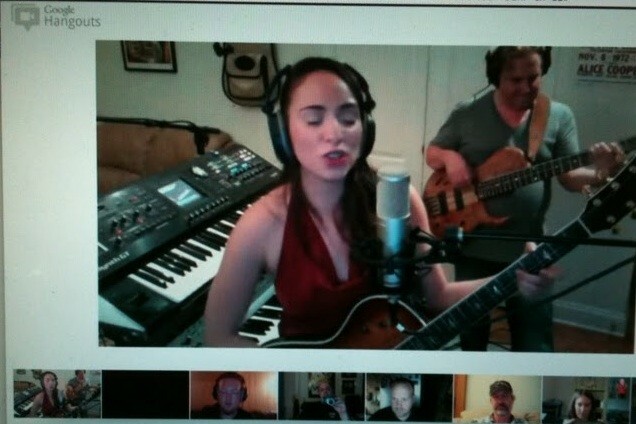 Indie pop singer Daria Musk spent more than six hours in a Google+ Hangouts session (s GOOG) Saturday night, playing with a few fellow musicians in a recording studio somewhere in Connecticut and having people from all over the world listen in and cheer her on. However, the first ever live concert conducted in Google’s new group video chat service had one major constraint: Only ten people could join Musk’s Hangout at a time; others were told to try again later. A number of audience members, including Google Engineering Director Chee Chew, figured out an imprmoptu way of daisy-chaining Hangouts, making it possible for others to join in on the fun by joining connected video chats. This type of Hangouts relay was a quick hack, something to deal with the fact that Google has restricted the number of live participants in Hangouts to ten — but it also hints at an interesting opportunity for Google to utilize Hangouts as a way to turn live online broadcasting into a two-way medium, that is capable of real audience interaction. Live streaming has always lent itself to participation from the audience, something that broadcasters like CNN (s TWX) have utilized during events like President Obama’s inauguration to have people chat with their Facebook friends. Nowadays, integration with Facebook and Twitter comment feeds is a pretty common feature on many live streaming sites. Now imagine if the same was possible with video interactivity. Let’s say Musk had streamed her concert live on YouTube, and people would have been able to form video Hangouts with their friends around that live event. Or take a broadcaster like CBS, (s CBS) which regularly broadcasts live news coverage of events online on Ustream. Imagine that CBS’s audience was able to tune in through something like Hangouts, with friends discussing the event in real time with face-to-face interaction. Of course, the beauty of something like Google+ Hangouts is that it is more than just a broadcast. Tuning into a Hangouts session with Michael Dell and being able to talk business with the CEO of a Fortune 500 company is cool. Watching a live broadcast of Dell lecturing business 101 to thousands of passive viewers on the other hand may not be something you’d invite your friends to. But celebrity Hangouts can also be a frustrating experience. Sessions regularly fill up in seconds as soon as a someone like Michael Dell advertises his willingness to chat. Now imagine how long the queue will be once all the celebrities that turned Twitter into a major success story arrive on Google+. That’s why it would be great to see Hangouts take a hint from Chatroulette: What if someone like Musk could live stream a concert to thousands of viewers, coming together in hundreds of Hangouts sessions, and then jump from one of those sessions to the next, spending a few minutes here and there and giving her audience a feeling of being up close and personal? It would be like having a viewing party for a concert where suddenly the singer appears in your living room — and it could finally turn live streaming into something that is more than just plain old TV on a smaller screen. These journalists should try out the tools on yowie.com, where you can take live video and text questions from an audience of unlimited size (not 10 like on Google+), and have the crowd moderate it for you in real-time. Itâ€™s perfectly designed for the experience these journalists are trying to create. I like the idea of having multiple people involved in Hangouts. The limit can be an advantage for exclusive events though. “Intimate” hangouts with celebrities, that’d be pretty cool. Where’s the +1 button, eh?